I thought about doing damage numbers for a while now — floating damage amount indicators showing the amount of damage enemies receive from various sources. In the end, I decided to do these now — to show player weapon upgrade and mob health progression, show them how much damage weapons do, to show how armor and shields mitigate damage, to make it clear what mobs are “wearing”, and to make awesome animated visual feedback (hopefully). Unfortunately, I can’t really scale the number of it will lose it’s pixel-perfectness. If it’s a big problem later, I can change the font size or scale it after all. But the actual resolution the game would be played at isn’t that much larger than the default and having smaller numbers on a generally larger monitor is actually fine by me. I considered doing these by type or by source or by some combination. But I went with something that actually provides gameplay feedback about enemy health/armor/shields. I will need to tweak the animation and other properties. I chose the font and size pretty much at random, but the values work okayish. This actually looks much better, I think. Numbers moving with the player doesn’t really make sense, if one tries it out. 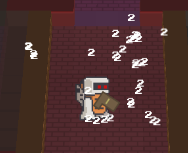 Another feature I thought about doing was combined damage numbers — that is, as long as the player hits the same mob in quick succession, a new number isn’t spawned, but the old one is increased. But that involves tracking mobs, their damage interval, tracking the numbers, then adjusting their expiry somehow. In short, too much work for questionable benefit. I am also not (yet) adding any numbers to barrels and such — they ought to explode in a few hits at most, so they shouldn’t really need numbers. I will also have an optional option in options menu to disable these — not everyone likes them.